Precondition: You have to have the javadoc window popped up next to the method completion dropdown list. I noticed that If I tap the up or down arrow key too fast, or (easier) if I hold down on the up or down arrow key, then sometimes instead of scrolling the method completion dropdown, the editor pane itself will scroll, causing the cursor to move away from the where the method dropdownlist is. (See attached picture). See attached picture. The javadoc window is popping up to the left of the method completion dropdown. Since most code is only a few indent levels deep, there will tend to be less space on the left side than on the right side. In my case, I usually have much more space on the right. I am having to scroll the javadoc window because it's been scrunched onto the left side. IDEA could check to see which side has more space, although it might be better to just let users choose which side they prefer to see it on: top, left, or right. That way it would consistently show up in the same place. 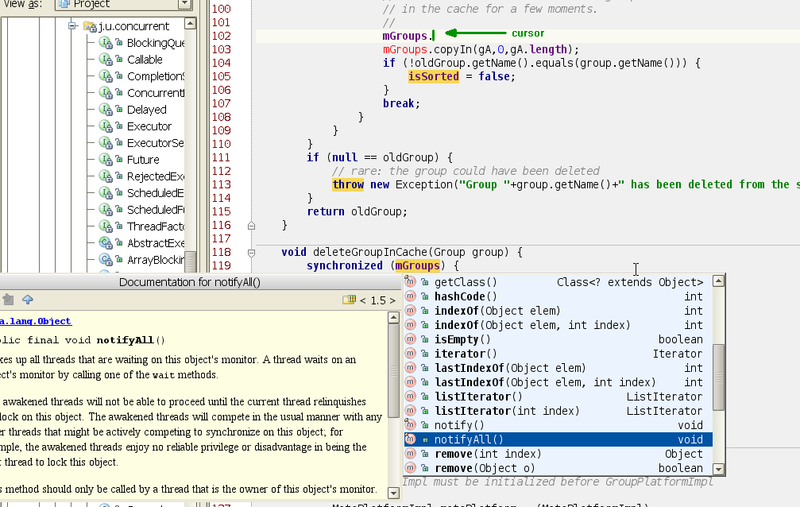 Issue #3 javadoc window blinks rapidly when scrolling the method completion list with arrow keys. A cosmetic issue is that the javadoc window pops down and back up each time you scroll the method completion window. If you start scrolling it fast, the javadoc window starts blinking rapidly. Is there anyway you could just reuse the javadoc window frame, and just replace the contents? This is strange, now during the same editing session, IDEA is now putting the javadoc window on the right side where it looks better. Don't know why it was putting it on the left earlier, and now the right.